The P Coy Fan Dance is a demanding sequence of non-navigational test marches staged over the highest peaks of the Eastern and Western sides of the Brecon Beacon Mountains. The historic and legendary routes that have lay dormant for nearly 30 years formed an integral part of Exercise Steel Bayonet; the final phase of the world-renowned Paratrooper & Airborne Forces Pegasus Company Selection course. The opening Fan Dance test takes on the two most iconic peaks in the entire Beacons range, landmarks steeped in both Paratrooper and SAS folklore. The FRV is followed by a brief respite before launching into the 10km High Speed March, true to the original P Company Steel Bayonet test. Starting at Cwm Gwdi, the abandoned military training camp and original P Company base, the ghost of past endeavours linger with the concrete bases of Nissen huts still visible amongst the trees. In use since the late Victorian era and allegedly used to prepare soldiers for the Boer War, military activity continued on the site up until the early 90s’, hosting the very first Pathfinder Platoon Selection cadre in 84 and the last ever Beacons P Company course in 92. The P Company Fan Dance marks an entrance onto Pen y Fan with a steep climb up to Allt Ddu spot height, followed by long drawn out slog over the exposed and windswept northern ridgeline up to the summit. An immense sense of history, pride and a strong surge of purpose comes in knowing that the faded footsteps of a generation of Paratroopers and SAS soldiers had marched the same hallowed path of this now ghosted route that had once determined the fate of so many men in search of something out of the ordinary. From Pen v Fan summit the route follows the SAS Fan Dance trail down to the iconic old red phone box RV where tabbers are required to log in before being escorted across the A470 to the western side of the Beacons National Park. The most demanding part of the course begins with the next RV located at the top of an immense Selection landmark… The early approach follows a rough single lane trail up a steady gradient that eventually veers off due south and enters the marshland sector dotted with vague sheep tracks and pockets of what is known in Selection fame as babies’ heads. After negotiating this sinking and waterlogged stretch of terrain, the looming menace of another legendary Selection feature begins with the staggeringly tough climb up Fan Fawr’s imposing North Face. From the marches’ second summit it’s onwards to the next RV where a half hour break and a hot stew and warm brew awaits. Make the time cut and satisfy the Directing Staff of former Paras & SAS and the battle to beat the clock starts over again on the P Company 10km High Speed March. The Steel Bayonet Fan Dance is at present a single day exercise that provides a beautiful, brutal and dramatic load bearing challenge with a strong sense of nostalgia and wilderness for much of the course. The route arguably provides an equal, if not greater physical and mental challenge than the SAS edition Fan Dance, certainly with more varied terrain and tougher underfoot conditions across two very different landscapes with rapid changing weather systems of their own. Aside from the race aspect of this event, just getting to the end is an accomplishment and something to be proud of. The P Company Fan Dance is open to ANYONE looking for a unique challenge: be it personal, competitive, as a sponsored participant in aid of your favourite charity or as part of a team building exercise. Our Steel Bayonet Fan Dance will be staged annually with both Load-Bearing and Clean Fatigue categories. Staffed by former Paratroopers and Special Air Service Directing Staff this special edition event will help raise funds for the Support Our Paras charity and will also be a tribute event to the late Paul Hutchinson, Paratrooper, friend, P Coy Fan Dance DS, and the only veteran on our team to have undertaken the original Steel Bayonet Fan Dance as part of the original Airborne Forces Selection. The event will support a memorial for Hutch to be placed somewhere in his spiritual home, the Brecon Beacons. All finisher’s will be presented with a special P Company Fan Dance cloth patch by a former or current serving member of the Parachute Regiment. There will be a complimentary hot meal and cold and hot drinks at the end of the event. Base camp, registration and the FRV (Finish) will be staged at Beacons Reservoir car park centre just off the A470. Refer to ROUTE & RV PROTOCOL section on this page for further location and logistical information. Official Bergen weight checks will take place during registration windows. The P Company Fan Dance will follow the same category format as the standard SAS Fan Dance. There will be Load Bearing and Clean Fatigue elements to the race in both a Main Field & Master’s divisions for both male and female athletes. Categories will be recognised and further divided according to the following age ranges and weight requirements. 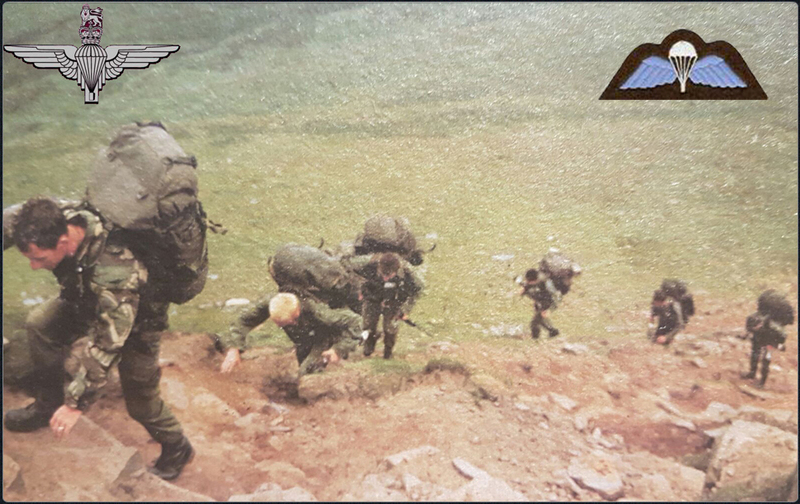 The P Company Fan Dance Race consists of a sequence of two back to back physically demanding non-navigational exercises covering 26km in total and just under 1000m meters of elevation gain. The P Company Paratrooper Fan Dance (16km) and its associated 10km High Speed march is not an out and back route. The opening segment of the event will start and finish in different locations with logistical arrangements in place to manage troop/participant movement. The Beacons Reservoir car park will serve as the event Base Camp/ Registration area and end of march Admin Point, with a FOB (Forward Operating Base & Start Point) (Cwm Gwdi) established at the northern end of the Brecon Beacons range. The 10km High speed march will start and finish at the FRV of the opening event where you will be served a hot meal and drinks and a forced 30-minute rest before starting the final phase of the event. The P Company Fan Dance Race follows the same RV protocol as the standard SAS Fan Dance, requiring you to pass through a series of DS manned rendezvous points. You will be required to log in with the DS at each RV to have your name and race number recorded and your suitability to continue assessed. Although both routes will be clearly marked a route map with easily identifiable key features and colour coded location segments will be issued along with a Safety Card holding emergency numbers. Despite the demands of the P Company Fan Dance you’re in safe hands on the high hills with AEE. Our organisation has an unblemished safety record operating in the most extreme environments and adverse weather conditions in the UK and on a wider global level. In our arsenal we possess the UK’s first and only internal event mountain rescue team, and the highest grade of medical cover, providing an unrivalled experience in the Brecon Beacons. Each test march is essentially a TAB (Tactical Advance to Battle). In the elite unit context, the exercise replicates advancing from the point of strategic insertion towards the theatre of operations while remaining undetected. By definition the main part of the mission commences once the TAB has been completed. The ability to TAB is essential to elite military units such as the Parachute Regiment, Royal Marine Commandos and Special Forces who are required to cover long distances at speed over arduous terrain while being completely self-sustained. If an Airborne soldier is unable through injury, poor personal administration or lack of fitness to be operationally effective and fulfil his role, he will become a liability and have put others’ lives in jeopardy. The ability to TAB, is therefore the bread and butter of the airborne soldier. The nuts and bolts of the P Company Fan Dance are so simple. Carry all you need over a certain distance. No man-made obstacles or tricks, just man against nature. But simple does not mean easy. Simple can also be primeval, brutal… all the mental & physical excess swept away by necessity. What is left? The stark beauty of such an experience has to be tasted first-hand.